The old year has finished, and a new one is easing into spring. There’s nothing like the promise and anticipation of new beginnings that the fresh breezes of spring can bring, which is why so many people use the season to clean up and make changes to their home. The design experts at All About Bathrooms have a number of bathroom remodeling ideas that are perfect for the season, and even better is that the results are almost immediate. One idea that has an immediate and visual impact is to change the bathroom flooring. It’s no secret that floors can become tired and dull, so installing new flooring can quickly perk up a bathroom and make it feel new and fresh. Marble flooring is always elegant and quite aesthetically pleasing. 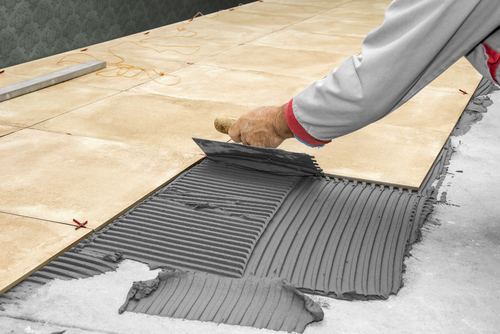 Another great option is to install slip-resistant tiles to improve safety. This is a perfect spring idea to implement for older homeowners. A bathroom’s look can be dramatically altered by installing colorful, festive floor tiles. The experts at All About Bathrooms can show you a wide variety of different colors, textures, and styles to choose from. A spring remodeling idea that is extremely useful is to increase the storage space in your bathroom. It always seems that there’s never enough room to store things like towels, soap, and other bathroom supplies. New vanities can be put into place that feature storage drawers, and new shelves can be installed to increase storage capacity. A little ingenuity can go a long way in allowing you to keep more stuff in your bathroom. A popular remodeling idea for spring is to swap out a tub or older shower with a new no-threshold shower. A walk-in shower allows you to use the flooring throughout the entire bathroom and helps create a seamless space. A curbless shower allows for easier access for older homeowners or those with physical disabilities. If you wish to be able to sit down, then a shower seat can be installed. A quick and easy idea to fulfill for the shower is to replace the old, standard shower head with something more luxurious, such as a rainfall shower head or a handheld one that offers multiple flow settings. An interesting bathroom remodeling idea is to create a separate room for the toilet. Such an endeavor is possible if the bathroom is large enough, and this change adds a touch of elegance by creating separate areas for the commode and the bathroom proper. Plus, it adds some additional privacy, which is very handy if you have a large family. Spring brings with it the promise of change and progress. A bathroom remodeling project that features such hallmarks is to go green by installing resource and energy-saving devices and fixtures. The design experts at All About Bathrooms can recommend a good number of low-flow toilets that can do just as good a job, or even better, than your old toilet does now. The same can be said for low-flow shower heads and faucets. There are even faucets that are activated by sensors and will automatically shut off when a person is no longer using it. Light fixtures can be replaced with energy efficient models and bulbs. Not only will you help preserve natural resources, but you’ll lower your monthly utility bills as well. One last bathroom remodeling idea for spring to ponder is whether to do a full remodeling project or a minor one. If you just wish to spruce up the old “throne room” a bit or want some minor changes, then consult with the fully licensed and insured professionals at All About Bathrooms to see how a few small changes can make a huge difference. However, if you’re really dissatisfied with your bathroom, then the start of the spring season is the perfect time to do a full remodeling project. There’s no reason to waste any more time with a bathroom that does not adequately fill your needs. Big or small, changes made to your bathroom now will pay dividends for years to come.